Doug Moe, a reporter for the Wisconsin State Journal, agreed to do an article on a lost ring we found in the snow early in 2015. This story is really incredible, as the man who lost the ring is blind. It’s truly one of my favorite lost ring stories. John and Judy were amazing and it was an absolute pleasure to help them find their lost ring. Doug Moe also did a great job on the article. After this story ran in the Wisconsin State Journal, we received over 12 calls from other people hoping we could help locate their lost rings. We were able to help 5 people reunite with their lost rings from years ago. 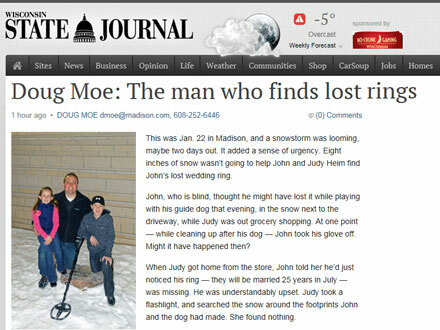 If you want to read the original story written by John and Judy, the couple who lost the ring, check out the story here: Lost Ring in Snow Bank – Found, Madison, WI.